Occasionally network administrators report difficulty getting Microsoft Windows clients to interoperate correctly with Samba servers. It seems that some folks just cannot accept the fact that the right way to configure an MS Windows network client is precisely as one would do when using MS Windows NT4 or 200x servers. Yet there is repetitious need to provide detailed Windows client configuration instructions. The purpose of this chapter is to graphically illustrate MS Windows client configuration for the most common critical aspects of such configuration. An experienced network administrator will not be interested in the details of this chapter. The builder of a house must ensure that all construction takes place on a firm foundation. The same is true for the builder of a TCP/IP-based networking system. Fundamental network configuration problems will plague all network users until they are resolved. MS Windows workstations and servers can be configured either with fixed IP addresses or via DHCP. The examples that follow demonstrate the use of DHCP and make only passing reference to those situations where fixed IP configuration settings can be effected. It is possible to use shortcuts or abbreviated keystrokes to arrive at a particular configuration screen. The decision was made to base all examples in this chapter on use of the Start button. Click Start -> Control Panel -> Network Connections. Alternately, click Start ->, and right-click My Network Places then select Properties. On some installations the interface will be called Local Area Connection and on others it will be called Network Bridge. On our system it is called Network Bridge. Right-click on Network Bridge -> Properties. See “Network Bridge Configuration.”. The Network Bridge Configuration, or Local Area Connection, panel is used to set TCP/IP protocol settings. In This connection uses the following items: box, click on Internet Protocol (TCP/IP), then click on Properties. 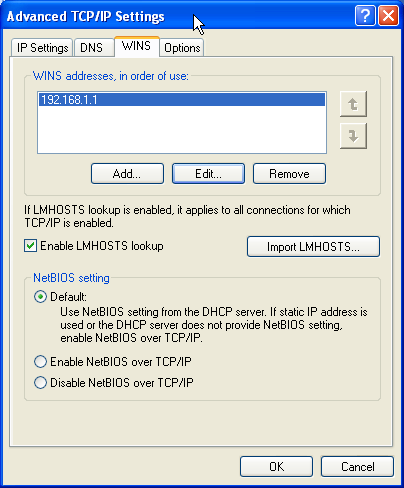 The default setting is DHCP-enabled operation (i.e., “Obtain an IP address automatically”). See “Internet Protocol (TCP/IP) Properties.”. Many network administrators will want to use DHCP to configure all client TCP/IP protocol stack settings. (For information on how to configure the ISC DHCP server for Windows client support see the DNS and DHCP Configuration Guide, DHCP Server. If it is necessary to provide a fixed IP address, click on “Use the following IP address” and enter the IP Address, the subnet mask, and the default gateway address in the boxes provided. Click the Advanced button to proceed with TCP/IP configuration. This opens a panel in which it is possible to create additional IP addresses for this interface. The technical name for the additional addresses is IP aliases, and additionally this panel permits the setting of more default gateways (routers). In most cases where DHCP is used, it will not be necessary to create additional settings. See “Advanced Network Settings” to see the appearance of this panel. 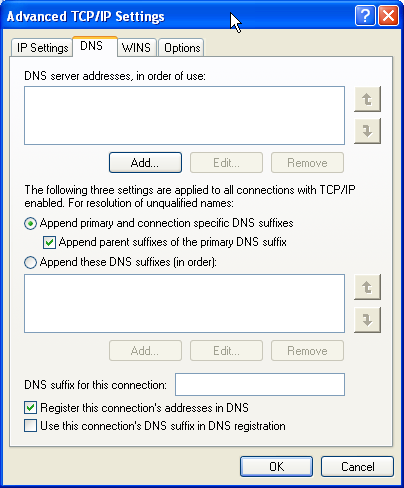 Fixed settings may be required for DNS and WINS if these settings are not provided automatically via DHCP. Click the DNS tab to add DNS server settings. 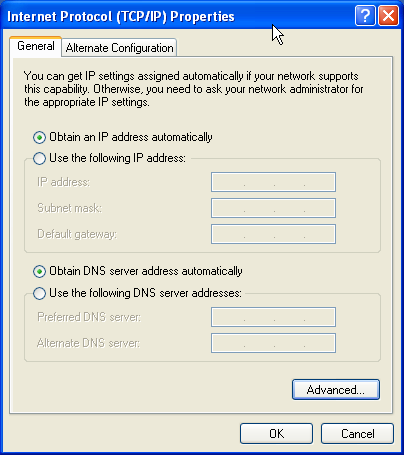 The example system uses manually configured DNS settings. When finished making changes, click the OK to commit the settings. See “DNS Configuration.”. Click the WINS tab to add manual WINS server entries. This step demonstrates an example system that uses manually configured WINS settings. When finished making changes, click OK to commit the settings. 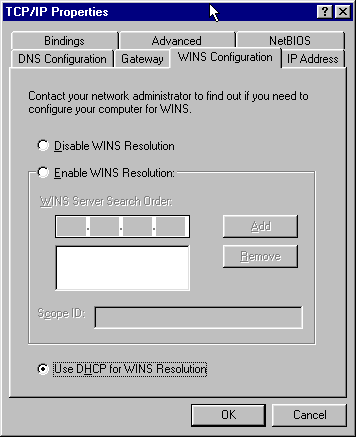 See “WINS Configuration”. Click Start -> Control Panel -> Network and Dial-up Connections. Alternatively, click Start, then right-click My Network Places, and select Properties. Right-click on Local Area Connection, then click Properties. See “Local Area Connection Properties.”. 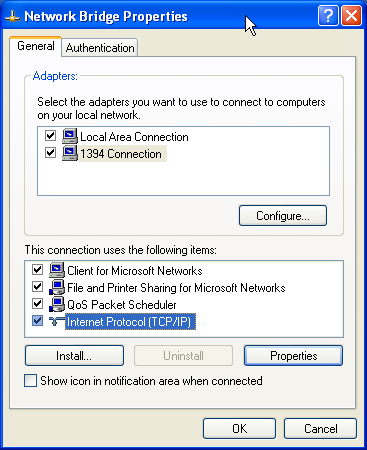 The Local Area Connection Properties is used to set TCP/IP protocol settings. 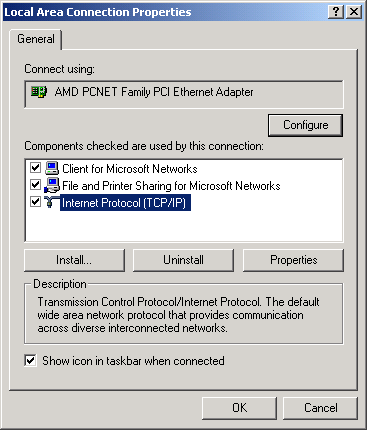 Click on Internet Protocol (TCP/IP) in the Components checked are used by this connection: box, then click the Properties button. Many network administrators will want to use DHCP to configure all client TCP/IP protocol stack settings. (For information on how to configure the ISC DHCP server for Windows client support, see, “DHCP Server”. 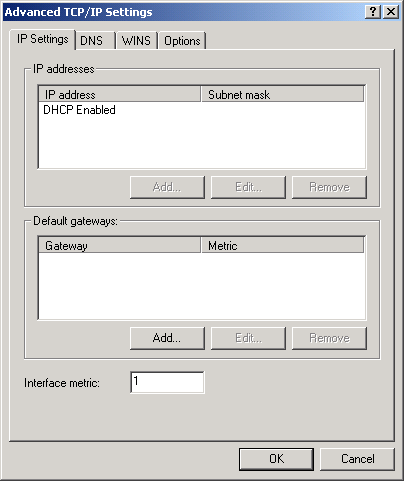 If it is necessary to provide a fixed IP address, click on “Use the following IP address” and enter the IP Address, the subnet mask, and the default gateway address in the boxes provided. For this example we are assuming that all network clients will be configured using DHCP. Click the Advanced button to proceed with TCP/IP configuration. Refer to “Advanced Network Settings.”. Click the DNS tab to add DNS server settings. 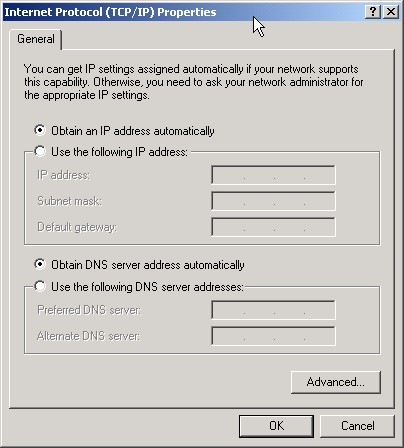 The example system uses manually configured DNS settings. When finished making changes, click OK to commit the settings. See “DNS Configuration.”. Click the WINS tab to add manual WINS server entries. This step demonstrates an example system that uses manually configured WINS settings. When finished making changes, click OK to commit the settings. See “WINS Configuration.”. Alternatively, click on Start ->, and right click on My Network Places then select Properties. In the box labeled The following network components are installed:, click on Internet Protocol TCP/IP, then click on the Properties button. See “The Windows Me Network Configuration Panel.”. 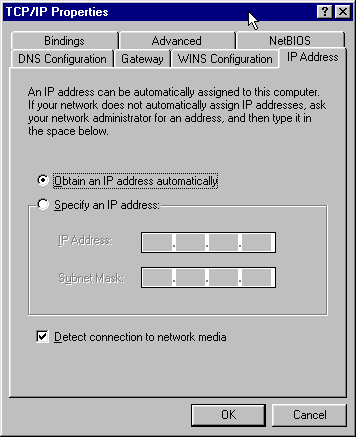 Figure�8.11.�The Windows Me Network Configuration Panel. Many network administrators will want to use DHCP to configure all client TCP/IP protocol stack settings. (For information on how to configure the ISC DHCP server for Windows client support see the DNS and DHCP Configuration Guide, DHCP Server. The default setting on Windows Me workstations is for DHCP-enabled operation (i.e., Obtain IP address automatically is enabled). See “IP Address.”. If it is necessary to provide a fixed IP address, click on Specify an IP address and enter the IP Address and the subnet mask in the boxes provided. 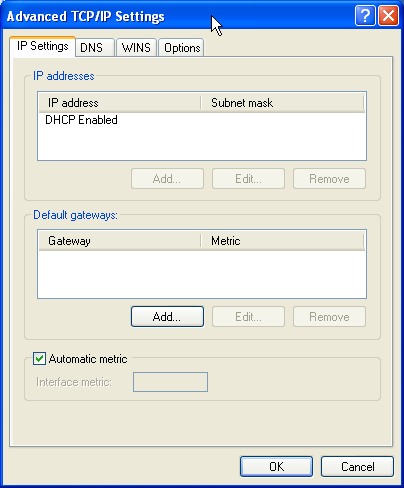 For this example we are assuming that all network clients will be configured using DHCP. 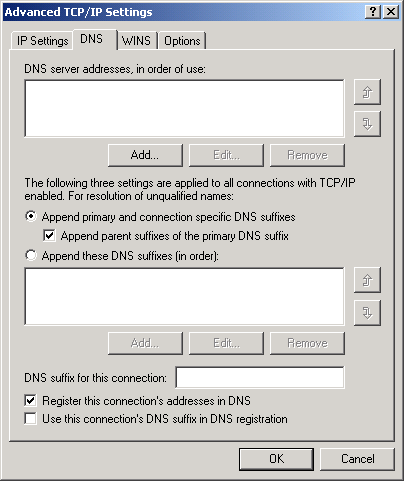 If necessary, click the DNS Configuration tab to add DNS server settings. Click the WINS Configuration tab to add WINS server settings. The Gateway tab allows additional gateways (router addresses) to be added to the network interface settings. In most cases where DHCP is used, it will not be necessary to create these manual settings. The following example uses manually configured WINS settings. See “DNS Configuration.”. When finished making changes, click OK to commit the settings. 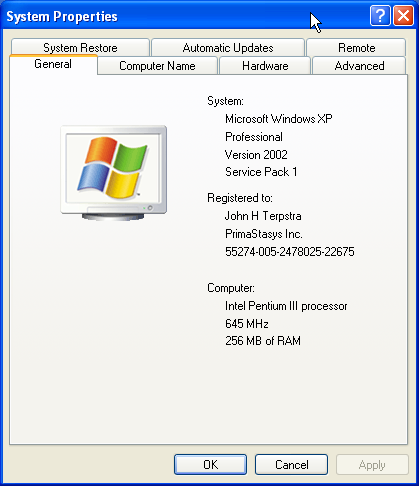 This is an example of a system that uses manually configured WINS settings. One situation where this might apply is on a network that has a single DHCP server that provides settings for multiple Windows workgroups or domains. See “WINS Configuration.”. Microsoft Windows NT/200x/XP Professional platforms can participate in domain security. This section steps through the process for making a Windows 200x/XP Professional machine a member of a domain security environment. It should be noted that this process is identical when joining a domain that is controlled by Windows NT4/200x as well as a Samba PDC. Right-click My Computer, then select Properties. The opening panel is the same one that can be reached by clicking System on the Control Panel. See “The General Panel.”. Click the Computer Name tab. This panel shows the Computer Description, the Full computer name, and the Workgroup or Domain name. Clicking the Network ID button will launch the configuration wizard. Do not use this with Samba-3. If you wish to change the computer name or join or leave the domain, click the Change button. See “The Computer Name Panel.”. Click on Change. This panel shows that our example machine (TEMPTATION) is in a workgroup called WORKGROUP. We will join the domain called MIDEARTH. See “The Computer Name Changes Panel.”. Figure�8.17.�The Computer Name Changes Panel. Enter the name MIDEARTH in the field below the domain radio button. This panel shows that our example machine (TEMPTATION) is set to join the domain called MIDEARTH. See “The Computer Name Changes Panel Domain MIDEARTH.”. Figure�8.18.�The Computer Name Changes Panel Domain MIDEARTH. Now click the OK button. A dialog box should appear to allow you to provide the credentials (username and password) of a domain administrative account that has the rights to add machines to the domain. Enter the name “root” and the root password from your Samba-3 server. See “Computer Name Changes Username and Password Panel.”. 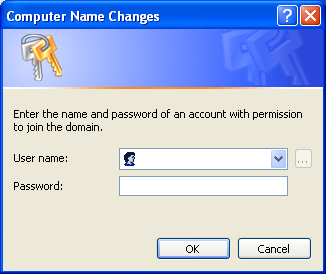 Figure�8.19.�Computer Name Changes Username and Password Panel. 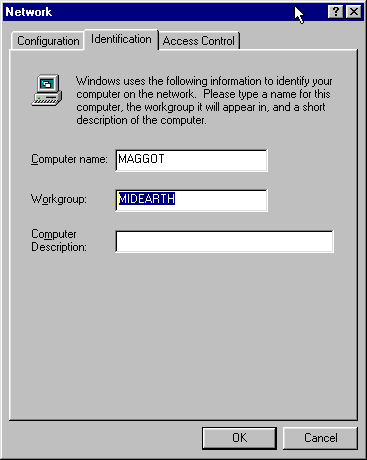 The “Welcome to the MIDEARTH domain.” dialog box should appear. At this point the machine must be rebooted. Joining the domain is now complete. We follow the convention used by most in saying that Windows 9x/Me machines can participate in domain logons. The truth is that these platforms can use only the LanManager network logon protocols. Windows XP Home edition cannot participate in domain or LanManager network logons. 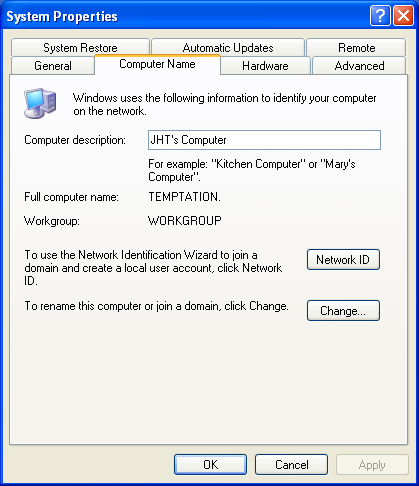 Right-click on the Network Neighborhood icon. The Network Configuration Panel allows all common network settings to be changed. See “The Network Panel.”. 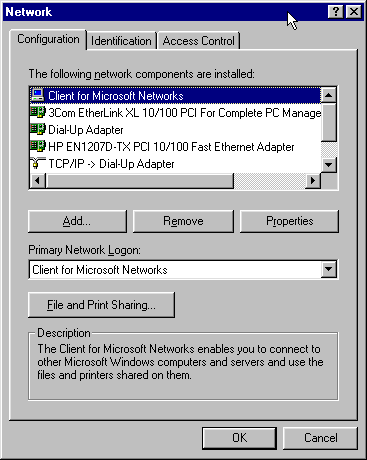 Make sure that the Client for Microsoft Networks driver is installed as shown. 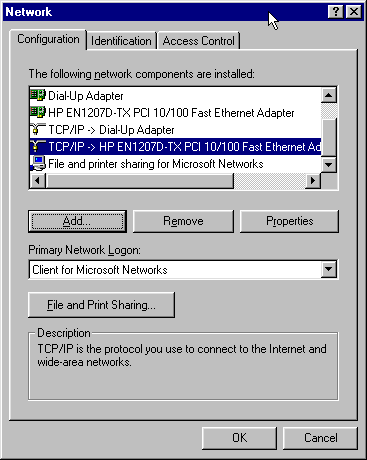 Click on the Client for Microsoft Networks entry in The following network components are installed: box. Then click the Properties button. 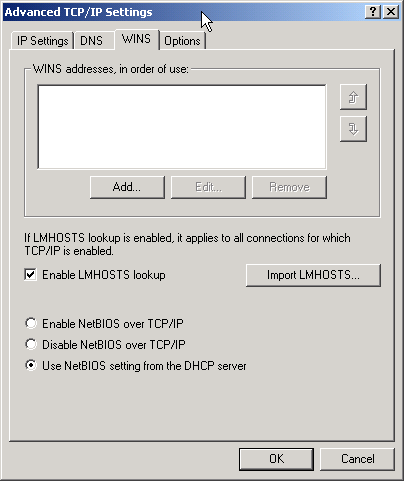 The Client for Microsoft Networks Properties panel is the correct location to configure network logon settings. See “Client for Microsoft Networks Properties Panel.”. Figure�8.21.�Client for Microsoft Networks Properties Panel. 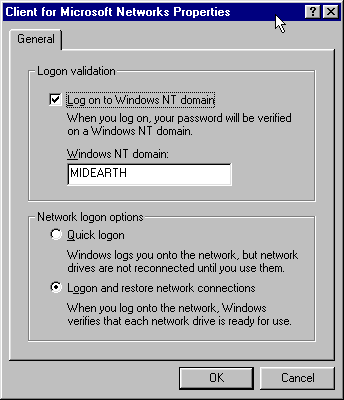 Enter the Windows NT domain name, check the Log on to Windows NT domain box, and click OK.
Click on the Identification button. This is the location at which the workgroup (domain) name and the machine name (computer name) need to be set. See “Identification Panel.”. Now click the Access Control button. 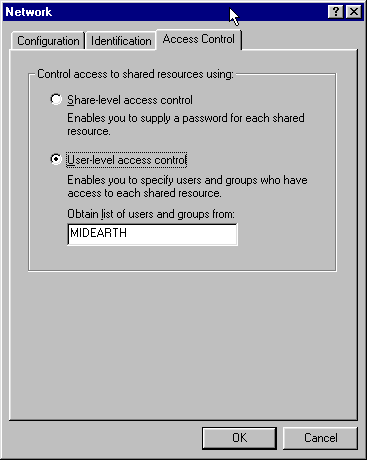 If you want to be able to assign share access permissions using domain user and group accounts, it is necessary to enable User-level access control as shown in this panel. See “Access Control Panel.”. Use of a Network Scope setting watch out for this one! smb.conf does not have correct add machine script settings. “root” account is not in password backend database. Attempt to use a user account instead of the “root” account to join a machine to the domain. Open connections from the workstation to the server. Firewall or filter configurations in place on either the client or the Samba server.